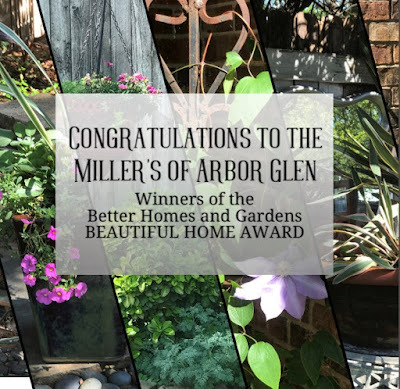 Better Homes and Gardens awards the Miller's of Arbor Glen the Beautiful Home of the Month award. Arbor Glen is a beautiful community in Euless, Texas. The front lawns are all maintained by the HOA so the residents get to really spend time on their gardens. The Miller's take this to a whole other level. When you drive up you're immediately welcomed with a beautiful vignette of colorful flowers. As you stroll through the front yard you'll notice sweet almost picturesque areas full of imagination. Going into the backyard you're hit with every color you can imagine. The entire backyard is full of special areas to sit and relax surrounded by nature. Mrs Miller is an artist and it shows throughout her yard. The Millers have unique art work mixed among the landscape. Everywhere you look there is something special hidden among the flowers. I could spend all day looking for these beautiful pieces of art. They have decks built with arbors and trellises draped with greenery. There truly is someplace different to sit each day and enjoy just being at home. If your lucky you'll catch the Miller's while they're out working on their yard and get invited over for a glass of wine. It's such a great place to sit and visit together as neighbors. The weather is perfect this time of year. The flowers are in full bloom the yard is just perfect and ready for guest. Congratulations to the Miller's for creating a beautiful home. It's such a pleasure to give you this award. I look forward to our next visit. If you think you have an award winning yard contact me at jean.robb@winansbhg.com Who knows maybe your yard will be the next winner.